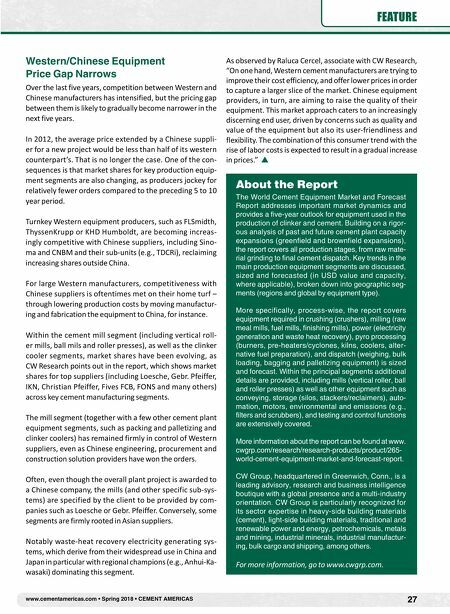 www.cementamericas.com • Spring 2018 • CEMENT AMERICAS 27 FEATURE Western/Chinese Equipment Price Gap Narrows Over the last five years, competition between Western and Chinese manufacturers has intensified, but the pricing gap between them is likely to gradually become narrower in the next five years. In 2012, the average price extended by a Chinese suppli- er for a new project would be less than half of its western counterpart's. That is no longer the case. One of the con- sequences is that market shares for key production equip- ment segments are also changing, as producers jockey for relatively fewer orders compared to the preceding 5 to 10 year period. Turnkey Western equipment producers, such as FLSmidth, ThyssenKrupp or KHD Humboldt, are becoming increas- ingly competitive with Chinese suppliers, including Sino- ma and CNBM and their sub-units (e.g., TDCRi), reclaiming increasing shares outside China. For large Western manufacturers, competitiveness with Chinese suppliers is oftentimes met on their home turf – through lowering production costs by moving manufactur- ing and fabrication the equipment to China, for instance. Within the cement mill segment (including vertical roll- er mills, ball mils and roller presses), as well as the clinker cooler segments, market shares have been evolving, as CW Research points out in the report, which shows market shares for top suppliers (including Loesche, Gebr. Pfeiffer, IKN, Christian Pfeiffer, Fives FCB, FONS and many others) across key cement manufacturing segments. The mill segment (together with a few other cement plant equipment segments, such as packing and palletizing and clinker coolers) has remained firmly in control of Western suppliers, even as Chinese engineering, procurement and construction solution providers have won the orders. Often, even though the overall plant project is awarded to a Chinese company, the mills (and other specific sub-sys- tems) are specified by the client to be provided by com- panies such as Loesche or Gebr. Pfeiffer. Conversely, some segments are firmly rooted in Asian suppliers. Notably waste-heat recovery electricity generating sys- tems, which derive from their widespread use in China and Japan in particular with regional champions (e.g., Anhui-Ka- wasaki) dominating this segment. 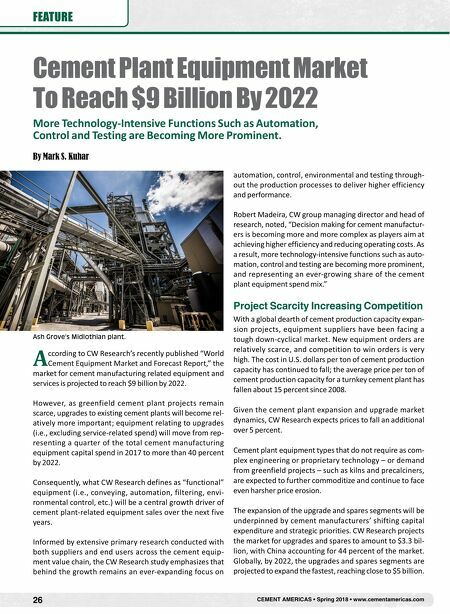 As observed by Raluca Cercel, associate with CW Research, "On one hand, Western cement manufacturers are trying to improve their cost efficiency, and offer lower prices in order to capture a larger slice of the market. Chinese equipment providers, in turn, are aiming to raise the quality of their equipment. This market approach caters to an increasingly discerning end user, driven by concerns such as quality and value of the equipment but also its user-friendliness and flexibility. The combination of this consumer trend with the rise of labor costs is expected to result in a gradual increase in prices." About the Report The World Cement Equipment Market and Forecast Report addresses important market dynamics and provides a five-year outlook for equipment used in the production of clinker and cement. Building on a rigor- ous analysis of past and future cement plant capacity expansions (greenfield and brownfield expansions), the report covers all production stages, from raw mate- rial grinding to final cement dispatch. Key trends in the main production equipment segments are discussed, sized and forecasted (in USD value and capacity, where applicable), broken down into geographic seg- ments (regions and global by equipment type). More specifically, process-wise, the report covers equipment required in crushing (crushers), milling (raw meal mills, fuel mills, finishing mills), power (electricity generation and waste heat recovery), pyro processing (burners, pre-heaters/cyclones, kilns, coolers, alter- native fuel preparation), and dispatch (weighing, bulk loading, bagging and palletizing equipment) is sized and forecast. Within the principal segments additional details are provided, including mills (vertical roller, ball and roller presses) as well as other equipment such as conveying, storage (silos, stackers/reclaimers), auto- mation, motors, environmental and emissions (e.g., filters and scrubbers), and testing and control functions are extensively covered. More information about the report can be found at www. cwgrp.com/research/research-products/product/265- world-cement-equipment-market-and-forecast-report. CW Group, headquartered in Greenwich, Conn., is a leading advisory, research and business intelligence boutique with a global presence and a multi-industry orientation. CW Group is particularly recognized for its sector expertise in heavy-side building materials (cement), light-side building materials, traditional and renewable power and energy, petrochemicals, metals and mining, industrial minerals, industrial manufactur- ing, bulk cargo and shipping, among others. For more information, go to www.cwgrp.com.